Bakery Rounders are also referred to as dough dividers/rounders and they commonly take premixed dough and portion them out into predetermined sizes and round this portion out to fit into a pan or directly on to a proofing conveyor or oven band. Bakery rounders come with specific ranges to keep the portions accurate and consistent. Peerless Model PBD6, 6 pocket stainless steel, bread divider, with production rates from 35 to 180 pieces per minute – depending materials, application and number of heads Product range from 6 to 36 ounces for white breads, variety breads, ethnic breads and frozen doughs. 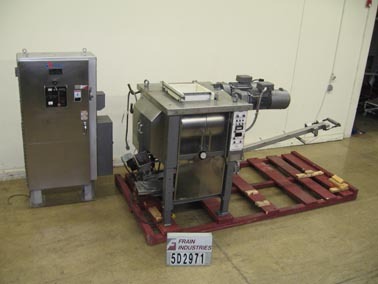 Equipped with 60" long x 12" wide neopreme product conveyor and flour duster with ram, knife, division box and ejector, all driven by hydraulic cylinders. Allen Bradley 1000 touch screen with panel view controls with operator ethernet interface for up to 45 pre programmed product selections and operator can adjust variables for changing dough. Mounted on stainless steel frame with height adjustable legs and cage style safety guarding.